Berlin has been a major destination for the visual and performing arts since the turn of the century. Voted ‘America’s Coolest Small Town’ by Budget Travel in 2014, Berlin is fewer than 10 miles from the beach. Nationally known for being “historically charming and artistically alive” Berlin has served as the backdrop for the Hollywood films Runaway Brideand Tuck Everlasting, and now boasts a vibrant downtown complete with Victorian architecture, galleries and boutiques including the Maryland Wine Bar, which celebrates the state’s growing vintages. Beyond the places to shop, though, Berlin has developed a culinary culture that has turned it into a destination for food. From upscale dining at Si’ Culi to the classic bistro experience at The Globe there are plenty of great restaurant choices. 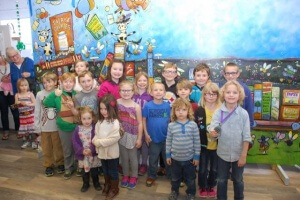 Students from Buckingham Elementary pose before a mural they helped paint as part of one of the town’s many public art projects. Berlin became an art destination by an act of government, but a force in the art destination world by an act of will. Although it has been an arts and entertainment-designated city for decades, over recent years it has become a major draw for artists and art enthusiasts. 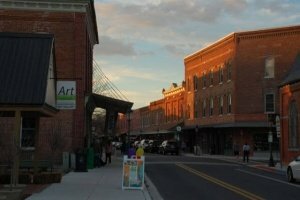 The 2nd Friday Art Stroll is the town’s way of keeping relevant in the arts scene by giving local artists the place to share their work. In addition to being a great place for painters, Berlin celebrates writers, actors and street performers every month. Additionally, the town is one of the few destinations for original music in the region. Beyond that, Berlin has established itself as one of the premier destinations for traditional music as well. Thousands of people come to the annual event to take part in this festival that has grown from a few guys knocking around to one of the major jazz and bluegrass festivals in the region. What makes it a draw is a combination of the world class performers the town invites every year as well as the competitive nature of the hundreds of musicians who come from all over the country to perform with one another as well as to give solo concerts. The Berlin Fiddlers Convention was founded in 1992 as a way for people who enjoyed traditional music to come together and enjoy one another’s company and musicianship. Over the years it became a massive event as word got out that it was the place to be. This early September event remains popular rain or shine, though generally it shines.